My friend Chris Abbott visited last night after work, and we worked on the sector plate that represents Simcoe, Ontario and points north. By the end of the evening, we had our first trains running across the entire railroad. I ran a common wire from the track bus to one contact on each of these jacks, then individually wired the leads to each track to the other contacts. Finally, I connected the two contacts in a 1/4″ plug with a short piece of wire. When the plug is inserted into a jack, it completes the circuit to the corresponding track – and only one track can ever be powered at a time. 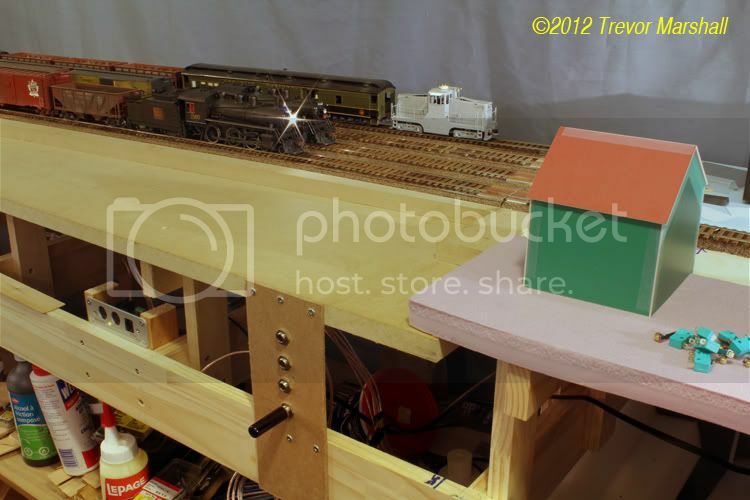 In the photo, the plug is in the jack for track 1, and the headlight is lit on the train on that track. Easy peasy. I’ll play around with this for a while, enjoying running trains, while I decide what form of track power assignment I want to install on a permanent basis. First, I designed the lighting system so the light would fall off as staging is approached. Note how bright the closest tobacco kiln is, compared to the one in the distance. That bright side also draws the eye, so I’ll emphasize that when I build the structures – perhaps by doing full detail on the closest kiln and making the other four less visually busy. The second technique involves the addition of a wind break of trees across the layout at the entrance to staging. I’ve temporarily installed some evergreens and I’m pleased with the effect. I think a row of deciduous trees will work even better. Having a working sector plate means I can clear the tracks in St. Williams – and that means I can start holding real operating sessions! 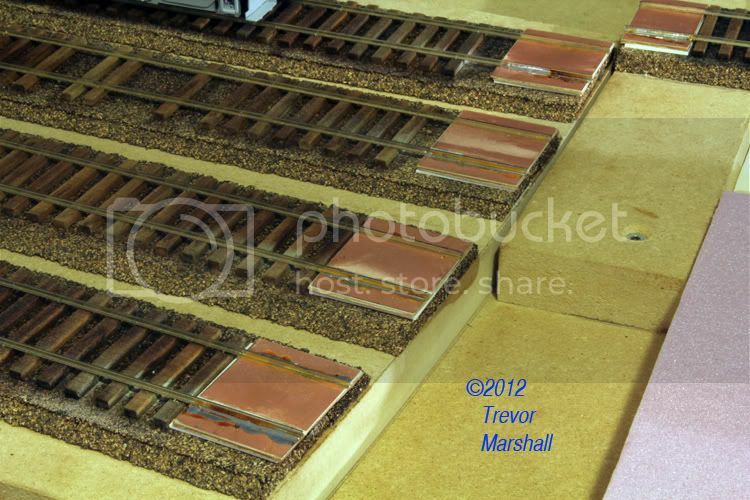 This entry was posted in rail, sector plate, St Williams tobacco kilns, structures, track work, wiring by Trevor. Bookmark the permalink.